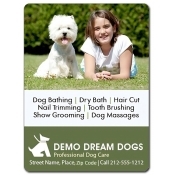 Custom dog care magnets are for businesses which are involved with animal and pet care. Individual and customized pet service is a brilliant marketing term for pet care businesses and they have to work hard to prove that they are the best at it. This time they can propagate this term with confidence by indulging any of these dog magnets. It can be perfectly displayed over cars, fridges or handed out to clients, friends, family, co-workers, pet lovers and more. Avail of our free full color imprint. Caring for pet dogs is a gratifying career choice for all those who wish to convert their passion into a thriving profession. There is range of career choices people can make such as caretaking, training, breeding, grooming and more. Whatever be the nature of the business, each comes with its own set of challenges and benefits. The biggest challenge of all is building trust around a business. 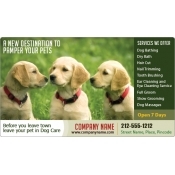 Our promotional dog care magnets will help you gain prominence. 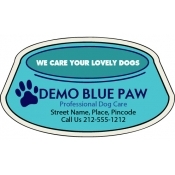 Logo pet care magnets have aided several pet care businesses to stick their business information. 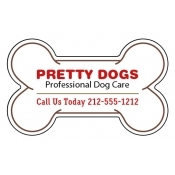 Our team understands that dog care is a broad term and its requirements largely vary. Over the years, we have been closely working with all of these services to understand their requirements and delivering apt dog care veterinary magnets for their business. 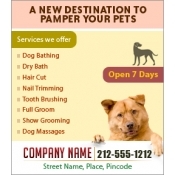 Our selection of dog care magnets features some of the best-selling animal and pet care magnets which have been ordered and reordered over the years. Every year we process huge orders for bone shaped magnets, dog bowl magnets, dog shaped magnets, animal shaped magnets, paw shaped magnets and some sizes of rectangle and square magnets. We offer free art setup, free shipping, free online design proof and attractive price savings on all orders. Our tailored pricing packages have benefitted start up dog care services and established animal care services equally. 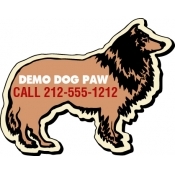 If you are a beginner, dreamer or financier of a new dog care service, do not hesitate to approach us with your need of custom vet magnets to propagate your idea. You can contact us at info@CMagnets.com or call us at 855-762-4638 (Toll Free).